Q. How can I achieve phase inversion? In the October 2000 issue of Sound On Sound there was an article called Improving Your Stereo Mix. In example three ('Ye olde phase trick'), you explained a technique that increases the perceived width of the stereo mix using phase inversion. I want to use this technique, but as my mixer doesn't have phase-invert buttons I'm not sure I can? I have a Signex CP44 unbalanced patchbay in which I've wired some sockets in parallel, so splitting the signal is no problem. On the returns, could I use balanced cable and swap the hot and cold pins to create the phase inversion, or would this not work, as the original signal and patchbay are unbalanced? 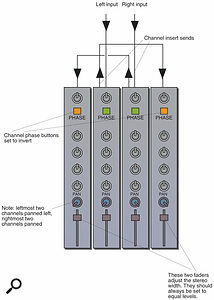 Technical Editor Hugh Robjohns replies: The technique you're referring to works by adding some of the right-hand signal to the left-hand channel out of phase and some of the left-hand signal to the right-hand channel out of phase. You can read the original article on-line at www.soundonsound.com/sos/oct00/articles/stereomix.htm, but I've included the original diagram here for easy reference. Many phase-inversion tricks aren't mono-compatible, but one advantage of this widening technique is that when the left and right channels of the final mix are summed to mono, the effect disappears without causing any problems. Swapping the hot and cold pins at one end of the cable feeding a balanced input will indeed invert the phase of the signal. 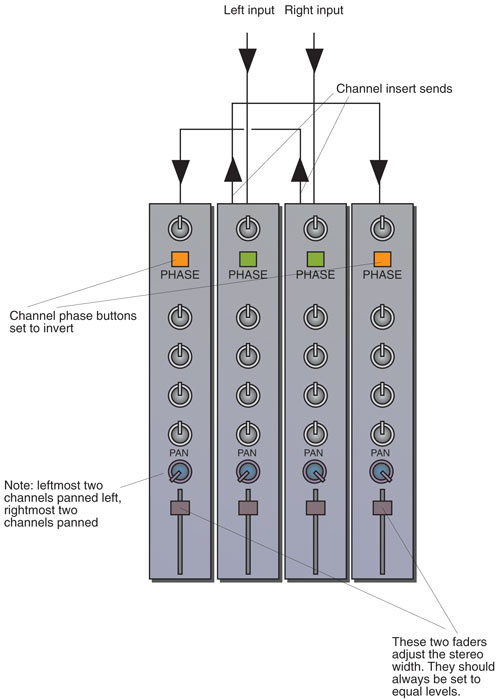 Another way you can achieve the same thing is to use a pair of aux outputs from the main channels (one for the left signal, the other for the right) instead of splitting the signal at the patchbay. The advantages are, firstly, that the aux outputs are properly buffered and, secondly, if you make these post-fade sends, the inverted return channel levels will follow the input-signal level, making mixing easier. You may also benefit from the fact that in many budget consoles the aux outputs are phase-inverted relative to the main inputs, which would avoid the need to make up inverting cables! You'd have to experiment to find out if your mixer provides inverted aux outs.